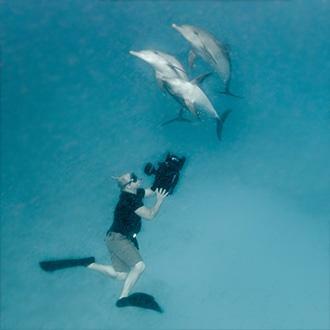 Emmy award-winning editor Sean Hickey traded in his snow skis for scuba fins when he moved to Miami from New Hampshire in 1990. After graduating from Barry University with a Batchelor’s degree in Sports Management, Hickey honed his skills as an underwater videographer and editor while working aboard a South Florida charter boat as a scuba instructor. Hickey started working at WPBT2 in 1997, working as a videographer and editor on many acclaimed productions. His diving experience make him a great asset to the Changing Seas series, for which he is the Director of Photography and editor. Hickey and his wife Debbie enjoy spending time with their three dogs, two cats, a bird and a fish.